Behind the Dubai palace in Karachi, near the seashore, there lives a merry old man. He holds a treasure which is unparallel in this world. A treasure which is most likely to be destroyed……… The reason being, most of us still questions the validity of the argument that it is indeed a treasure. 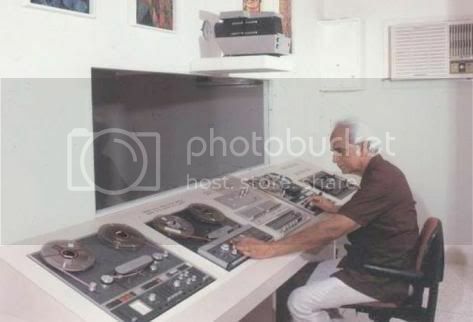 In his house under specially built cabinets are rows and rows of audio tapes. When played they tell you the history of Indo Pakistan music, literature and poetry. You can find Ustad Bundo Khan playing his Sarangi, Pathanay Khan singing his tunes, Chotay Bukhari and Baray Bokhari reciting their essays in the earlier days of Radio Pakistan, Maulana Thanvi and Rasheed Turrabi reciting Quran or giving sermons or Faiz Ahmed recording his entire Nushka Hai Wafa in a span of 20 years in his studio. 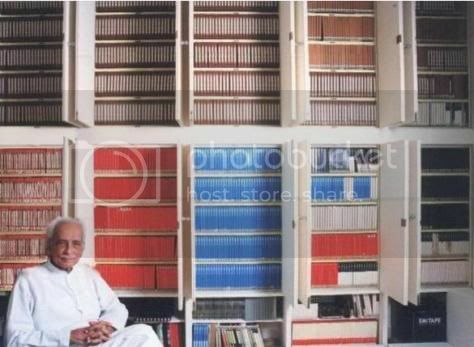 All this is not disorderly, you will find neatly bound 42 volumes of just his music catalogue showing which tapes contains which masterpiece, from which counter number to what counter number, sung or played by whom, what raag and what instruments. If this is not enough at the ripe old age of 93, this man, alone is trying to convert this universe of sound to digital media from tape. Did I forget to mention, he is an avid collector, traveller, photographer and author. His biography â€œHijraton Kay Silsalayâ€ won the Prime Minister award in 1998 right before the Prime MInister was send packing. The name of this mad man is Lutfullah Khan. But before delving deeper into his collection letâ€™s dig deeper into who he is. Born on November 25, 1916 in Madras, his father was in South Indian Railway. His childhood was spent on transfer from one city to another. Although he tried his hands at different hobbies, however music, writing and art were things that became part of his soul. He describes his interest as more of a â€œjunoonâ€ as far as music is concerned. To have a better understanding of this â€œjunoonâ€ and his mastery of music itself, his book â€œSur Ki Talaashâ€ is a must read. He had extra-ordinary fascination for music and singing from his childhood. He participated as an amateur singer at the Madras Boys and Girls Exhibition in the year 1931 and received the merit award for Hindustani Music. He signed an agreement in 1933 for classical singing with the Indian State Broadcasting Service, later re-named as All India Radio. He performed publicly at the age of 19, during a radio concert in 1935. Known as Madras Radio Artist, he sang Ghazals at a function of Muslim Students Association of St. Xaviers College in January 1939 and rendered classical singing at Bombay in December the same year. During quarter century of daily practice (1963-1988), he practiced singing with Maulana Abdul Shakoor (nephew of Ustad Abdul Karim Khan) and explored the intricacies of only one raag, the Darbari. His â€œjunoonâ€ of collection also started from those days. His collection of stamps, coins and film pamphlets of his teen years can still be seen in the neatly organized show cases in his house. His museum gallery displays rare photographs, photography equipment, International and Pakistani coins, and a set of 12 inch 78 rpm discs of Late “Barey Ghulam Ali Khan Sahib“, sound recording equipment and accessories, drawing instrument and stationary items used in documenting the collections and personal items of nostalgic importance as well as a wonderful matchbox collection. But the pick of this array is an album containing posters of old Hindi and American movies, some of them dating back to twenties. All are arranged in properly illuminated showcases and display boards. Electronic devices installed include “Revox” tape recorders. Such a broad based collection requires periodic maintenance for which he has established in a separate room a small workshop with inventory of spares and tools. In 1938, he moved to Bombay. He was employed in the governmentâ€™s rationings department. One of the responsibilities was to transport various stuff to different cities of India. He had the good chance to see almost all of India (except for Calcutta and Kashmir which he still regrets). He landed in Karachi on October 17, 1947. This trip was more of an exploratory nature. But who has escaped the magic of this medusa? However the start of his love affair is unique. He mentions that he was stung by the beauty and cleanliness of this city. However he was stunned to look at Karachiâ€™s double rotis (sandwich bread). They were fresh and pure white. Unlike the stale yellow rationed breads of Bombay. â€œTo yeh madrasi naujawan, Karachi ki double rotiyon ko dil day bethaâ€. He telegrammed his family to move over here and this love affair is still strong after 62 years. If you want to know more about Karachi and its inhabitants of yesteryears, his biography is an eye opener. He mentions a host of Sindhi Hindus and Christian which helped him establish himself and how they were all Karachities first and foremost, a thing which sounds like a Cinderella story today. He mentioned only one Muslim to compare with this group. That gentleman was Abdul Salam, my nana (maternal grandfather) and that is how I came to know Lutfullah Sahib so intimately. Photography was his passion for a long time. In Bombay the famous actor De Billemoria was his friend. He had a chance to borrowing his 16mm Kodak movie camera and made movies of different occasions. However his real passion blossomed in Karachi. His friend bought the Thackersons photography shop. He lent his Roliflex camera to him to take picture. He took picture of the old buildings and the new offices and homes that are taking shape to absorb the new country and its administration. He made an album about Business on footpath which consists of all the things that are done on Karachiâ€™s footpaths, right from small businesses to snake charmers, palmists, lizard show (saanday ka teel), ear cleaner etc. There was another album called business on wheels which shows fruit, vegetable, cloth, shoe etc vendors of Karachi on four wheel carts. He created his own dark room at his home and used to do his own developing and processing. In 1951, he bought a Swiss made Boulex Pylord 16mm camera and started making documentaries. One of the most memorable one was a cricket match between the Prime minister, his cabinet and the parliament members at the Karachi Gymkhana. One side was lead by Mohammad Ali Bogra and the other by the famous Maulvi Tameez Uddin Khan. The minster Mr. Chittophadia was bowling in his dhoti and Maulvi sahib was batting in his sheerwani. The organizer was Ahmed E.H. Jaafer. He bought several cameras and took thousands of pictures during his travels throughout the globe. The cameras and pictures album forms a part of this treasure. (1) The first section is instrumental music. It contains items on almost all music instruments of the sub continent by masters of that era. Some of the examples are in Surood, Hafiz Ali Khan and Ali Akbar Khan, in Sitar Inayat Khan, Vilayat Khan, Ravi Shankar and Ustaad Sharif Khan poonch walay. In Shehnai Bismillah Khan, in flute Panna Lah Ghosh, in table Ahmed Jaan, Allah Rakkha etc, in Sarangi Bundo Khan. He includes about 46 items of Bundo khan in his collection. He tells an interesting story about Ustaad Umrao Bundo khan, the son of Ustaad Bundu khan. At 10:30 pm in 1978, somebody rang the bell. When he opened the door, it was Umrao Bundu with his Shahnai. That 14 minute 12 second rendition of Peelu was one of the best he had in that section. (2) The second section consists of Classical singers such as Fayaz Hussain Khan, Moizuddin Khan, Chand Khan Zakir brothers and so many more. (3) Semi classical music occupies the third section. This is more of Thumri, Pahari, Dadra, Kaafi, Bhajan etc. (4) Fourth consis of Ghazals (including 318 of Mehdi Hasan) including Begum Akhtar, Sehgal, Shamshad, Rauf Dakkani, Mukhtar Begum, Mushtri Bai etc. (7) Finally his seventh sub-section is Qawwali. The Urdu literature section is divided into poetry and prose. Poetry contains the work of 800 poets. Faiz and Akhtar ul Imaan recorded their entire work for his library. Some of the other names are Jagan Nath Azaad, Sufi Ghulam Mustafa Tabassum, Parveen Shakir, Josh, Jigar, Khatir Ghaznavi Ali Sardar Jaafri, Kaifi Aazmi, Faraz etc. Prose contains such items as Aal Ahmed Suroor, Ibrahim Jalees, Bokhari, Taaj, Hayat ullah Ansari, Rajinder Singh Bedi, Joginder Paal, Chiragh Hasan Hasrat, Anwar Sadid, Khadija Mastoor, Rashid Ahmed Siddiqui, Dr. Zakir Hussain and hundreds more. The scholars and speeches sections include names like A.K. Barohi, Sir Zafar Ullah Khan, Rashidi brothers, Dr. Saleemuzaman Siddiqui, Karrah Hussain, Bahadur Yaar Jang, Abdul Hameed Bhashani, Bhutto, Rajindir Parshad, Suharwardy, Ghandhi and Jinnah. 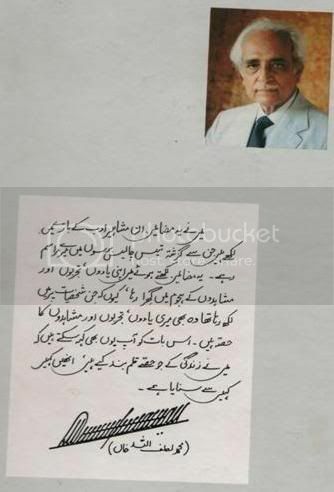 Similarly the religion section includes Thanvi, Syed Mohammad Razi, Zaheen Shah Taji, Mufti Mohammad Shafi etc One of the smaller but a unique section is interviews of artists like Jimmy Engineer, Iqbal Jeoffrey, Iqbal Mehdi, Bashir Mirza, Sadequin, Shakir Mirza etc. The story of this journey is extremely interesting. His book, â€œTamashaye Ahal-e-Zauqâ€ provides profiles some of the personalities above and efforts that were put to record them. Especially the struggle to record Faiz Sahib in a span of 20 years is worth a read. Now letâ€™s venture into the darker part of our story. I mentioned at the start that this treasure will soon be no more. There is a reason behind it. Tapes have a life of their own. They can only be saved if they are converted to digital media. Khan Sahib is doing this job himself but you can very well imagine what to expect from a 93 year old. He has been approached by some organizations but he flatly refused. The reason; they want to have the treasure for free. He has been offered an outstanding price of this collection from India but he refused too as he want to keep this collection in Pakistan. His argument is that if nobody in Pakistan thinks that my lifetime work which is in part a unique history of Indo-Pakistan on sound is worth nothing and it would not benefit me and my family in anyway than this should be destroyed. The whole effort of recording and organizing this collection is my â€œjunoonâ€. Letting it rot is another dimension of my â€œjunoonâ€. 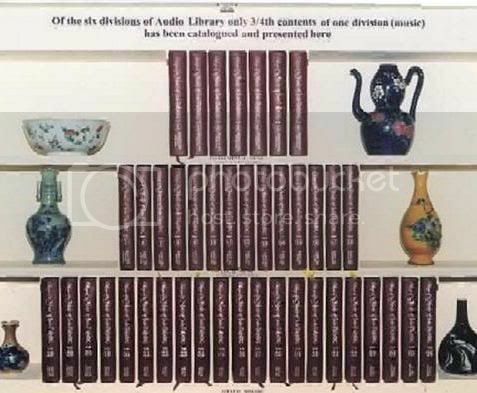 He worked tirelessly for this collection and if this mighty nation of 170 million who spent billions on things from arms to tea and cars cannot spend a few millions for acquiring and safeguarding their own audio heritage than perhaps his logic is make sense.